To generate the Web Celebs ranking, we first defined a “Web celebrity” as a person famous primarily for creating or appearing in Internet-based content and for being highly recognizable to a Web-based audience. That definition excludes people who were significantly famous before they hit the Web–like author and pundit Arianna Huffington–and leaves us with a pool of people whose fame depends on the Internet. Next, we created a candidate list of over 250 Internet personalities. Each candidate was ranked in five areas: Web references as calculated by Google; traffic ranking of their homepages as calculated by Alexa; Technorati rank of their primary Web sites or blogs, TV and radio mentions and press clips compiled from Factiva; and number of followers on microblogging site Twitter. We gave extra weight to results from Alexa, Google and Factiva. All five categories were totaled to produce a final score, and sorted to arrive at our rankings. That list of 25 ended up including one woman, Heather Armstrong. Women who just missed the list or dropped off it included Gina Trapani, Xeni Jardin, and Kathy Sierra. Where the hell are all the women? First and foremost, the authors used a clearly defined and objective process for selecting the peeps on their list. Second, I don’t perceive any active role of sexism. However, I’m left scratching my head over why so few women made the numbers cut. So much so, it woke me up at 5:30 this morning. Having no wish to spend the time double checking Forbes‘ numbers (and doubting there’s anything wrong with them), I’m left with my theories about the dearth of women on the list due to the numbers game. BlogHer comes to mind as one the largest such groups to combine the efforts of women on the web. When things are done as a group, singling out any one individual for recognition becomes tricky because how do you weigh impact, especially in a large, active community? It’s sometimes easier to measure in offline communities when women can run for PTA president (huge job by the way…do you know how much fundraising they do?) or other public offices. Shiny gadgets can be seen as infinitely more attractive than the day-to-day details of being a mom. Women also show a willingness to talk about things our other halves can be less comfortable with (note: I don’t say always): emotions, relationships, personal introspection, etc. While I don’t agree with everything she does, I’ve been a little surprised at the flak Penelope Trunk gets for her openness about all aspects of her life and not just running a startup. We devour celebrity gossip but wag our fingers at individuals sharing personal details? Seems contradictory to me. It’s a common enough saying, “behind every great man, is a great woman.” Not to imply that the men who made the list aren’t great in their own right, but I suspect several wouldn’t be there if they didn’t have the help of women to run day-to-day things. Robert Scoble has always been very open about his appreciation for Maryam, his wife, who blogs, too. Whether it’s wives, girlfriends, or mothers, women often end up in the nonglamourous roles, leaving little time for stardom. The same is true for women in business. Sometimes we end up managing the details to make sure the bigger picture happens. I could go on with the list, but the point would be the same: measuring exclusively by numbers creates a gap. Perez Hilton took top honors this year on the web celeb list. Forbes noted that a new post appears every 12.5 seconds and his site attracts 4.8 million viewers a month. I’m curious though, how much of his content do you think will matter in six months or even a year? I don’t believe the core of this argument is about men versus women, but rather about how we place value on what people do. Yes, the ability to generate money matters from a survival standpoint, and numbers help determine the potential money generation. However, as recent market events have shown, numbers can be twisted, hiding the reality. Don’t we stand to benefit if we can look beyond the numbers? The hypocrisy of Senator Christopher Dodd amazes me. Why? To be clear, Dodd wants all those naughty Wall Street peeps to give back their bonuse, but I see nothing in the news about him offering to make up the $75,000 break he received from a company involved directly in the current economic mess. I believe we should be asking hard questions asked about Wall Street bonuses paid out in 2008, particularly if they were paid with tax dollars. However, I find it tacky that one individual who is doing so sees nothing wrong with receiving what amounts to a questionable bonus. If we’re truly suffering from a “crisis of confidence,” according to Dodd, then how do his actions help counteract that confidence? Don’t talk to me about how Wall Street should behave when it’s still unclear whether your hands are any cleaner. Dodd’s case is neither unusual nor limited to either political party. What makes this situation so frustrating is the lack of transparency. One of the reasons I’m enchanted (yes, enchanted) with Larry Lessig’s Change Congress movement is it’s position “that politicians should work for the people, not special interests.” You can’t get much more transparent. Even more powerful is its acknowledgment that the system itself has to be reformed in order for change to happen. This language gives me confidence in the potential for my government to be better than it is today. Dodd calling for “every possible legal means” does not instill confidence because his actions bely the words. Whether you agree with President Obama’s agenda, one piece that we can all get behind, regardless of affiliation, is that things need to change. What are you doing to effect that change? Living in a snowy state, I’m all too familiar with snow removal. This morning at 3:45 a.m. I had the pleasure of witnessing firsthand my city’s snow removal operation. Two road graders removed the bulk of the snow in the road. That’s when the entertainment began, and I got a well-deserved reminder that we don’t always use our tools wisely. Two backhoes were moving steadily down the street. As they got closer, I realized they were clearing snow piles from driveways created by the road graders. The first backhoe turned into the driveway with its bucket upside down then dragged the snow backwards. 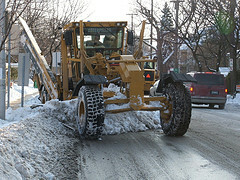 This movement was repeated twice, creating a row of snow out in the road, which required an additional forward scoop or two by a backhoe to finish clearing the driveway. As I watched these two backhoes, it became clear that neither was responsible for a particular action. One backhoe randomly performed one or both actions before moving on to the next driveway. Instead of backhoe #1 doing the initial removal with backhoe #2 doing the final clearing, the process appeared random and inefficient with each driver doing whatever struck his fancy. This behavior highlights our very human tendency to get stuck in a habit, despite the options we have available. Much of our decision-making isn’t necessarily driven by what makes sense but by what we’re used to, even ignoring the potential of the tools we have at our disposal. The comparison seems ludicrous, but imagine trying to eat soup with a fork in spite of a spoon sitting next to the bowl. That’s what some of our behavior looks like. It even affects the way we use language. I’ve mentioned it before, but I still find it frustrating when people look at me oddly for using my full vocabulary. I try to take into account my audience and judge what words are best suited for the situation, but there are still times that I get grief for using “big” words. If a better word exists to describe something, doesn’t it make sense to use that word? Despite the existence of an assembly line organization in meat slaughtering, it didn’t automatically replicate in other industries. Henry Ford saw the potential for improved efficiency and implemented the system in his factories, helping lower the overall cost of automobile production. Since then, other industries have implemented assembly lines, giving it little thought. However, it took one person in the beginning to see the potential application in another setting before assembly lines became a common practice. The same things happens with other good ideas or tools. Thomas J. Watson, IBM’s chairman of the board during the first half of the 20th century, had the confidence to state, “I think there’s a world market for about five computers.” Luckily for Apple, Dell, HP, IBM, et. al., he was wrong (I have five in my possession at the moment). The things we can do now with the computers were only a dream when the first machine was built. Imagine what will be possible in 10 or 20 years. Again, such progress takes someone looking past the status quo and understanding the potential. We’ve been mired in talk of Web 2.0 for years, with a sprinkling of Web 3.0 beginning to enter conversations, and I’m not sure we’ve learned the lesson of Web 1.0: whatever the iteration, what matters more is what you do with the tools. Like my early morning snow crew, we stick with the tried, whether or not it’s really true. For me, this discussion is less about changing and more about trying. There’s no requirement that one must change if another option is available, but it seems silly to dismiss the option without fully understanding what’s available. Image courtesy of Urban Eyes on Flickr. As I’m fond of saying, words have power. Today, Timothy Geithner, the nominee for Treasury Secretary, proved as much in his written testimony with a direct shot at China. Here’s where my interest lies…we have yet to see a firm economic plan from the United States government so why the strong language aimed at America’s favorite banker? I claim no expertise in foreign currency matters, but I do wonder, like Mr. Fallows, why Geithner elected to use such blunt language for something that’s been a tricky diplomacy dance for years. While I might wish otherwise, China plays a large role in American piggy banks. What happens to our economic recovery if China decides to stop the flow of money? Think about it in the most basic of terms. If a child mouths off to a parent, odds of her continuing to receive a weekly allowance plummets. While America isn’t exactly a child, it is in a position of being reliant on another entity who has power in the relationship. Addressing China and Chinese policy that impacts American policy is a valid role for government officials. I can only hope that in coming months said officials will show more common sense in their efforts and words. With the U.S. divorce rate hovering around 50 percent, it’s not unreasonable to assume that half the husbands in America will be back on the market eventually. And a number of studies have shown that about half of all married men and women have cheated. These stats may explain why we no longer instantly brand any and all mate poachers as devil spawn and why so many women are willing to compromise other people’s commitments. As a culture, we understand that relationships are complicated and change over time. “We no longer expect most marriages to last a lifetime,” Kirshenbaum says, “so when a woman gets involved with a married man or vice versa, it doesn’t shock us the way it used to.” We almost expect it. I’m curious…do you think that the ability to keep (or not) marital vows is an indication of one’s ability to keep other commitments? The same question could be asked about any type of commitment. For instance, if a doctor can’t stick to her Hippocratic Oath, does it carry implications in other areas of her life? Vows, oaths, and whatnot are all words. It requires the intent of the individual to give them any power. So what do we give up when we betray those commitments? I have a thing for books and most anything related to places that hold books…book stores, libraries, shelves, etc. My heart holds a special place for the library of my youth (i.e. the library before computers and Internet). Watching Breakfast at Tiffany’s reminded me of this affection as I watched Holly and Fred search for his book in the card catalog (starting at about 1:40). There was something so grown up about pulling out those little drawers, flipping cards, and searching the shelves for the neatly typed titles. 40% of people in the US (and 34% in the UK) do not read books any more. They may surf the web, or the read the occasional newspaper, but they do not read more than one book (fiction or non-fiction) in a year. The closer you look at the statistics, the more depressing it gets. In the US, only 47% of adults read a work of literature – and I don’t mean Shakespeare, I mean any novel, short story, play or poem – in 2006. Adrian does an excellent job of explaining the larger issues related to the reading decline. I encourage you to read his full post. For my part, I’ve decided to be more public about my book reading. My interest is less in doing a book review per se, but more about demonstrating how much of my thinking is impacted by what I read. To start, I have 1,638 books in my personal collection. Of that number, I feel comfortable saying I’ve read about 75-80%. On average, I go through 4-5 books per week, less if my reading is for research/study versus pleasure. Throughout the coming year, I’ll share as appropriate (some of my reading selections are more mind candy than mind challenging) the books and the ideas they contain that make me think. Yes, there are a great many blogs and online writers who fire the imagination, but I never would have started blogging if I hadn’t been reading great books that got me thinking in the first place. My goal isn’t to rank the value of any creative source but rather to point out the necessity of pulling from all possible sources. Given that my posts tend to be lengthier, I suspect many of my readers will appreciate my New Year’s wish that you’ll enjoy book-filled weeks and months to come.